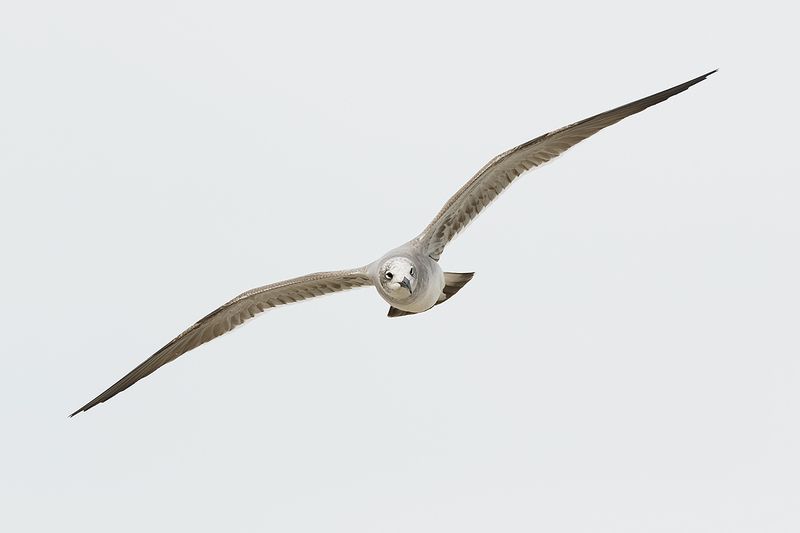 You Wanted Canon EOS-7D Mark II Birds in Flight Images? You Got 'Em (Incoming) & Best-ever Hand Held Flight Photography Combo? It was good friend and healthy living guru Dr. Cliff Oliver who reminded me about forced laughter…. Visit Cliff’s site and check out the neat interview video done a few year’s back on New Zealand TV. This blog post, the 327th in a row, took me more than 2 1/2 hours to prepare including the time spent on the image optimizations in DPP v3.14.41.0. It was published just before 7:00am from my home at Indian Lake Estates, FL. This image was created at Fort DeSoto Park in cloudy conditions on the morning of October 21, 2014. I used the hand held Canon EF 300mm f/2.8L IS II USM lens and a beta version of the Canon EOS 7D Mark II . ISO 400. Evaluative metering +2 1/3 stops off the sky: 1/1600 sec. at f/5 in Manual mode was a slight underexposure. Cloudy WB. Center Zone Shutter Button AF selected the central sensor and one additional sensor to its left. Both were active at the moment of exposure. The left hand of those two sensors was squarely on the bird’s face and covered both eyes (as originally framed). It is no wonder that this image was so incredibly sharp on the face. Click on the image to see a larger version. The Canon 300mm f/2.8L IS II lens and the Canon EOS-7D Mark II may very well be the most lethal combo ever for hand held flight photography. Most folks including me are able to hand hold this combination for long shooting sessions. It may be too heavy for some folks. If that it the case they might consider the Canon EF 70-200mm f/2.8L IS II USM lens with a 1.4X III TC (or even with the 2X III TC when they need additional reach). Folks who need to go even lighter are steered towards the tiny but deadly Canon EF 70-200mm f/4L IS USM lens. With this one we’d recommend only the 1.4X TC. Both of the above with a new 7D Mark II of course. So what’s so great about the 300II/7D II combo for hand held flight photography? Lots. First off, the equivalent 480mm focal length with lots of pixels on the bird gives you lots of reach and produces incredibly sharp, high quality images. Next, as I am learning quickly, the Zone AF Area Selection Mode with its new, five X five center zone seems to be a big improvement on previous iterations of the Zone AF Area Selection Mode… See more on the new Zone AF (and on iTR) below. And the ten frame per second frame rate is nothing to sneeze at. Lastly please do not forget that many folks will enjoy the lighter weight of the 7D II as compared to the 1D X. Which is heavier boys and girls, the 7D II coming in at a svelte 2 lbs, 5 oz, or the much larger 1D x that tips the scales at 3 lbs, 6.5 oz? At one pound, 1 1/2 ounces heavier, the 1D X is a shade more than 47% heavier than the 7D II. Over the course of a long flight photography session, the 1D X would seem a ton heavier. Center Zone Shutter Button AF had only the central sensor active at the moment of exposure. As originally framed the active sensor was right above the bird and hit nothing but the distant horizon line. Click on the image to see a larger version. With both the 5D Mark III and the 1D X I tried Zone AF but was not impressed. As I have long found it difficult to keep the central sensor only on the bird’s face, head or neck, I have always done my flight photography with more than just the central sensor active. With the two previously mentioned camera bodies, I tried Zone AF briefly but must not have been very impressed as I soon de-activated it on both the 5D III and the 1D X. With the 7D II I have found the new (wider) Zone AF to be a great improvement, not just for flight but for lots of general bird photography as well. In two instances here the new AF system produced sharp flight images with the sensor nowhere near the bird. This is a reflection of several things: the new AF system; the new wider Zone AF Area Selection Mode; and the effectiveness of my custom-created Case 3 AF settings. Please do not assume every single 300II/7D II image is sharp on the bird’s eyes and face. Most are sharp enough, many are insanely sharp, and some are not sharp. The latter due entirely to operator error, to not getting the sensor on the bird’s eye or eyes, face, or neck and panning smoothly with the subject as the system tracks the subject. That said, I firmly believe that this combo will prove to be the best ever for flight photography. 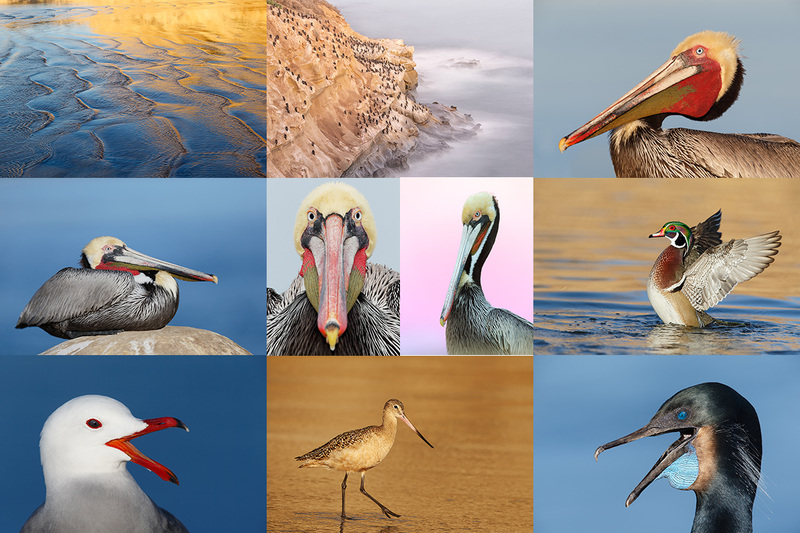 At San Diego and other locations where the birds may be too close in flight to fit into the frame I will turn to the aforementioned Canon EF 70-200mm f/2.8L IS II USM lens with or without the 1.4X III TC. This image was created at Fort DeSoto Park in cloudy conditions on the morning of October 21, 2014. I used the hand held Canon EF 300mm f/2.8L IS II USM lens and a beta version of the Canon EOS 7D Mark II . ISO 400. Evaluative metering +2 1/3 stops off the sky: 1/2000 sec. at f/4 in Manual mode was a slight underexposure. Cloudy WB. Center Zone Shutter Button AF selected the central sensor. It was active at the moment of exposure and covered the base of the bird’s left wing just past the bill as originally framed. This image is plenty sharp. Click on the image to see a larger version. You can see the original image below. Like many other folks, I have always had a hard time producing consistently sharp images of birds flying directly at the camera. The 7D II with its new AF system seems to do an outstanding job in this difficult situation. I can’t wait to get to Bosque with a 7D II on a morning with a nice southeast wind…. 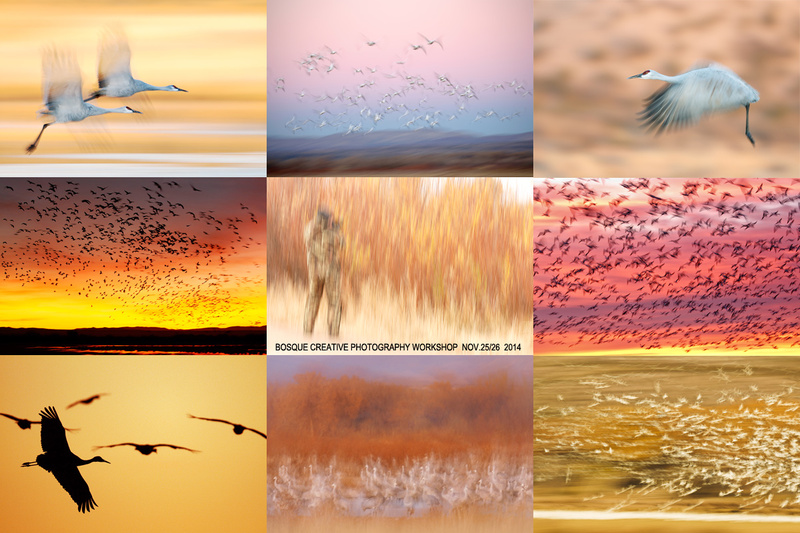 Please take a moment to let us know which of the three flight images you consider best. And do let us know why you made your choice. This unsharpened JPEG represents the original image from which the optimized version above was created. First I leveled the image by rotating it more than 3.5 degrees clockwise. Then I filled in the missing canvas using the John Haedo Content Aware Fill method. Then I moved the bird left in the frame using techniques from APTATS I and APTATS II and refined those layers with the addition of Regular Layer Masks. 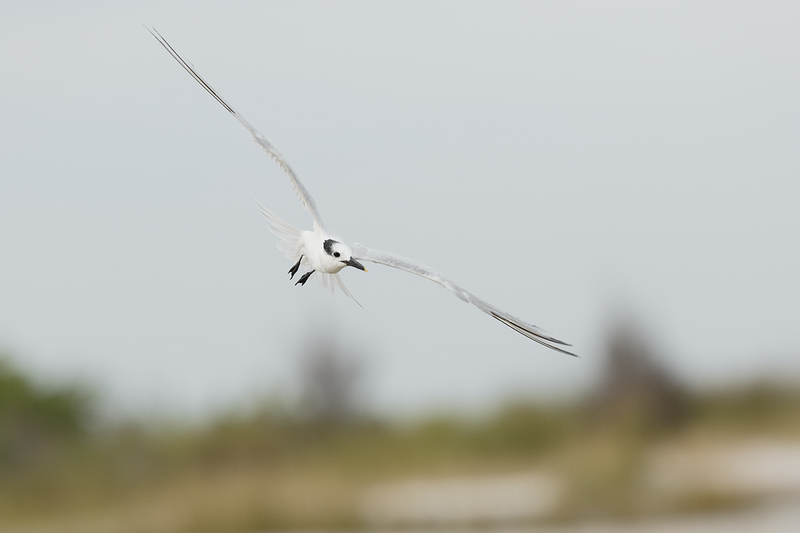 On the two tern images I applied my NIK 50-50 recipe to the bird only and fine tuned those with Regular Layer Masks. Lastly I sharpened the faces with a Contrast Mask (Unsharp Mask at 15/65/0). Coming on Monday: The DPP 4.0 Guide by Arash Hazeghi and Arthur Morris. The more that I use DPP 4.0 for my 1D X and 5D III RAW conversions–I remember those–the more I learn about it. And the more I learn about it the more I am impressed with it. Note: at present, DPP 4.0 will work only with 1D X, 5D III, and 6D images. I am hoping that at some point Canon will release a new version of DPP 4 that will support 7D II images. Everything that I did to optimize today’s images is covered in detail in my Digital Basics File–written in my easy-to-follow, easy-to-understand style. Are you tired of making your images look worse in Photoshop? Digital Basics File is an instructional PDF that is sent via e-mail. It includes my complete digital workflow, dozens of great Photoshop tips (including Surface Blur settings), details on using all of my image clean-up tools, the use of Contrast Masks, several different ways of expanding and filling in canvas, all of my time-saving Keyboard Shortcuts, Quick Masking, Layer Masking, and NIK Color Efex Pro basics, Contrast Masks, Digital Eye Doctor, using Surface and Gaussian Blurs, Tim Grey Dodge and Burn, how to create time-saving actions, and tons more. With yet another recent cancellation, there are now two openings on this long sold out trip. The creative IPT can easily be piggy-backed with several Festival of the Cranes events with artie and denise. See here for details. 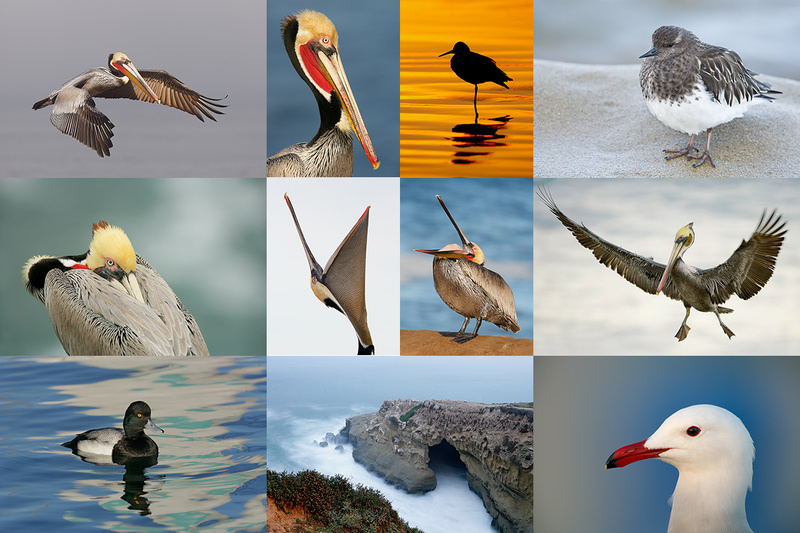 38 comments to You Wanted Canon EOS-7D Mark II Birds in Flight Images? You Got ‘Em (Incoming) & Best-ever Hand Held Flight Photography Combo? Thinking about grabbing a 7D2 for Bosque. Think that plus a 5D3 would be a good combo? Just need to decide what camera/lens combo goes on the tripod and which one goes on the shoulder. Artie, I am rally enjoying your blog. Thanks for the information on this camera. I have been waiting for a camera like this for a while now. I suspect this will be my first entry in to Canon. I will use your link when I am ready. Hey Artie…I’m new to your blog and want to thank you for all the helpful advice and information you’re providing on here. I currently shoot with a 1DX and the 400mm DO for BIF….sometimes with the 1.4XIII. From your perspective thus far, any strong reasons for a 1DX owner to also consider having the new 7D? Looks like weight and the zone AF may be the strongest factors for consideration. I’ve already come to peace with having to get closer to the birds without a crop sensor. Welcome to the blog. Actually, there are lots of reasons: great weight savings, all around improved AF, the new Zone AF, improved iTR and Face Detection AF, and of course the additional reach. I have barely mentioned the latter on the blog but with the extra reach comes many benefits. All that with image quality and high ISO noise control on a par with the 1D X.
Thx for the advice Artie! I am definitely planning to get the 70-200mm f/2.8 IS II and the 2X III extender very soon. I’ll purchase through your link. ps: please shoot me your B&H receipt via e-mail when you purchase. Thanks for this, Artie! It really gives us a professional first-hand look at the capabilities of this camera! I am waiting about Dpp4 rules…and I hope as soon. You wrote “As I have long found it difficult to keep the central sensor only on the bird’s face, head or neck, I have always done my flight photography with more than just the central sensor active.”…which is the best AF point setting, for your (for 1Dx) instead of only central sensor ? As I have posted here dozens of times I like Surround. You can learn a ton more about 1D X in our 1D X AF Guide. Another question, do you think it would be fine to sell my Canon 5d Mark III so that I can buy a Canon 7 D mark II? (I have also a Canon 1Dx). Actually, I will be keeping my 5D III for flowers, Urbex, scenic, and HDR photography. I may sell one of my 1D X bodies and replace it with one or more 7D Mark II bodies. I cannot, however, know what is best for you. It depends on what you like to photograph…. 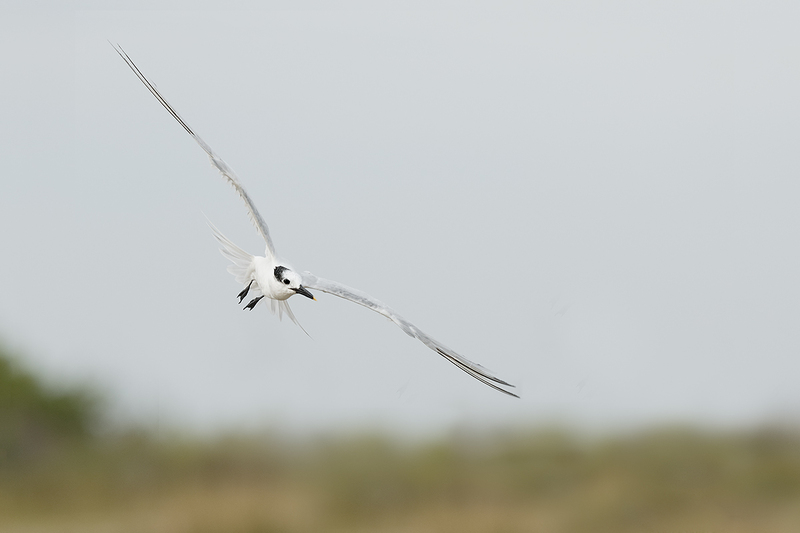 Also, the 3rd image also shows the bill and bill tip, which is distinct to the Sandwich Tern. Finally, the bird is above and separated from the background. I like that better than the 2nd image. You selectively removed the distractions from the image to give it a good clean separation line. (No competing background.) The last special touch is how the bird’s angle matches the background greenery in the bottom left corner. Something about that is very pleasing to my eye. I am no artist by any stretch, but that’s what I see and like…. Transitioning to a MacBook Pro? Giving up Breezebrowser? I have asked BreezeSys repeatedly if they have a Mac version, tthe answer is always no. Can you persuade them? I’m curious if adding a 1.4xIII to this combo would be a deal breaker for BIF? Primarily BIF + Non sky backgrounds. I have in mind a nice all day/hiking/handheld combo, that will yield successful results, unlike the exercise in frustration that the Tamron 150-600 provides; Sigma 150-600 is pre-ordered, but I’m worried it too may lead me down the same path. The Doug West idea sounds good for an ageing person but I hate giving up my original 600mm . Sure going to give it serious thought so I can remain mobile the next 10 years. Thanks Art for continuing views on the new 7D. Of course your white on light exposures have always been on target ! Ten minutes of laughing is beyond my capabilities but I am up to 1 minute which is great for me. Charles, take it from this ageing person who is shooting with a pair of 7Ds and the original 500mm f/4L IS (and a 1.4x II when I need it)that the 7D II, 500 II combo will be very nice. I’m finding that my 500 (about the same weight as the 600 II) is getting heavier as time goes on. Having handled Artie’s 500 II at a talk he gave in Orlando I have the 500 II on my short list. And after reading about the 7D II here and in other places, how can I pass on five years of improvements to my most used body. Awesome! I so want this camera! Thanks for all test photos Artie. I am so impressed! I like the 3rd image the best. I like the placement and angle of the bird. The first one is incredibly sharp! Thanks for all your help in the past. Around when is the best time of year to visit the Venice rookery? Hi, Artie, and thanks for these wonderful images. 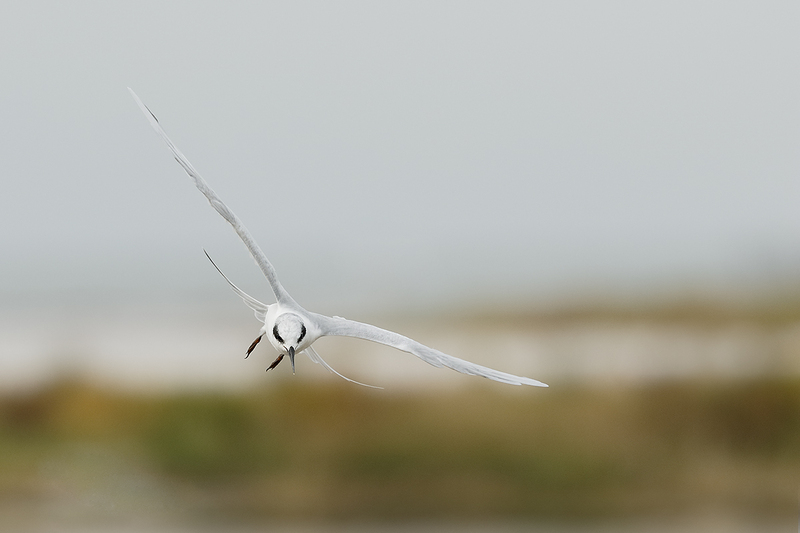 You have light birds against a light sky in the second and third images (sandwich and forster’s terns), so that’s even more of a challenge for the AF system, I’d think, and yet they are splendid. I think the last image is my favorite because of the bird’s head angle but I love them all. Many thanks. ok Arthur Morris donc c’est une question de lumière mais à f/2.8 il pique pareil qu’à f/4 c’est cela? Vous ne savez pas ce que vous demandez …. pourquoi vous avez pas shooter à f/2.8 ? au lieu de f/4, est ce que le piqué aurait été le méme? Bonjour Joel, Quand j’ai assez de lumière , je tiens à arrêter le bas un arrêt complet lors de l’utilisation d’un f / 2.8 . Quand il n’y a pas beaucoup de lumière , je travaille souvent grande ouverte à f / 2.8. When I have enough light I like to stop down one full stop when using an f/2.8 lens. When there is not much light I often work wide open at f/2.8. Thanks for the great flight images! I prefer the first one. It is so clean! up to the 600 IS (version 1), while keeping the IV. But now, I’m thinking, sell the IV, buy the II and instead of buying a 600, go with the 500, which would give me about the same distance, while also saving a pound or two. You’ve done a tremendous job these past few weeks on writing about the 7D II. ps: please e-mail for the product specific links when you are ready to pull the trigger. You might fly right off the beach…. Thanks Artie. I know, add the converters and yowza. My “plan” is to wait until Feb/March after tax refunds. Plus, I’m still the cautious type, chances are Canon will have some bugs that’ll need ironed out after this first batch comes out. BTW, I bought my 1.4x III thru your link. I don’t know what type of notice you get, but I hoped it worked (during the B&H’s holiday closing). Thanks Doug. Please send me your B&H receipt via e-mail so that I can check. Thanks. Just sent an email to you at the verizon email.